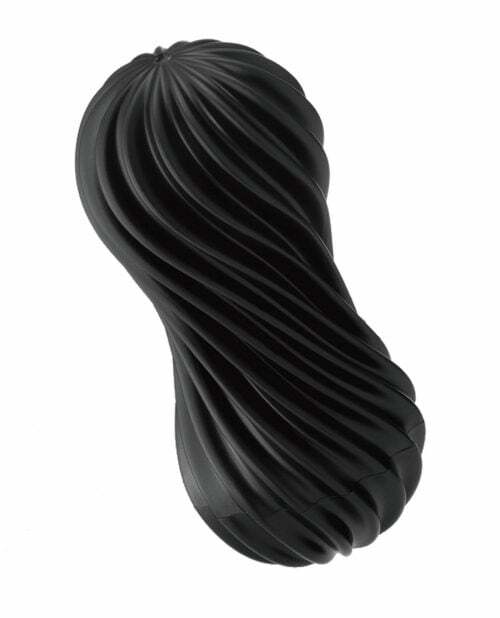 TENGA's latest malleable material has allowed them to create a brand new concept and sensation called the TENGA FLEX. This is the Rocky Black version of FLEX. The FLEX's spiral-ribbed outer case creates a âspinning stimulationâ. Simply cover the air hole at the top of the item after insertion, and the FLEX will wind and unwind, creating a spiraling movement as you stroke. Additionally, the FLEX's malleable casing allows you to squeeze, twist and grip the item to directly change the stimulation to suit your desire!The first chamber has small pointed nubs. The second chamber has spiraling micro ribs. The third chamber has larger crater like nubs. The end chamber has a zig-zag design along with a stimulation âstingerâ at the very end. Enjoy the dynamic pleasure made possible with TENGA latest material and intricate design in their FLEX series. Lose yourself in spiraling sensations! Find release with TENGA's new TENGA FLEX sleeve.